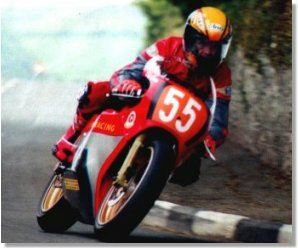 Chris Grose, the talented road racer from the Isle of Man spoke to us from his home in Sulby about racing, his yearly retirement and his views on the future of the TT Course. When and why did you start racing? My first race was actually in 1976. I only did one race and blew the bike up the next week. I bought a brand new CB 400 Honda for the road. In 1978 I crashed it over Tholtywill in the fog. My insurance trebled so I decided to race it and that was it. You must have had an interest in the T.T. at an early age, living right on the course? Yes I did from the age of 5 or 6 years old I used to get up at 4 o'clock in the morning with my dad who used to marshal. I would watch outside my house or at Sulby Bridge. My heros were Mike Hailwood and Bill Ivy. I remember in the morning practices it was so quiet and you could hear that amazing note of Hailwoods Honda or Ago's MV in the distance and we would try and guess by the tone who it would be. Strangely though I didn't ever think about racing myself until I was about 19 years old. In fact Dave Phillips ( Pauls Dad ) dragged me kicking and screaming up to Jurby and made me do it, otherwise I never would have bothered. Do you prefer Roads or Circuits? I like both but I have to say I was better at circuit racing than roads when I was younger. I think that as you mature as a rider you actually become a better road racer. You can't just tear at it like a bull in a china shop, you have to pace yourself and your machine and almost coax the bike home at times in road racing. Since the early days of the T.T. How do you rate the Top Riders of today compared to the to the greats of yesterday? I would have to say that the greats of the T.T. still are to me the ultimate riders who ever rode. There have been some great riders recently but, to compare them to the likes of Mike Hailwood and Agostini is nonsense. Hailwood and Ago were true world champions, who could race on any circuit at any level and win. People are very fond of comparing today riders at G.P. level with road races. The G.P. riders are total masters of their machines, if they choose to ride at the T.T. they would completely blitz the opposition. There has never been a G.P. rider who couldn't ride road circuits, they just choose not to. Unfortunately big sponsorship prohibits them from it for the pittance of prize money on offer compared to the risk involved. Do you feel any harm has been done to the sport with the recent allegations, regarding the 400 Race last year? To be honest I believe it could be one of the best things that could have happened, from a riders point of view. Any rider who has been around a while sees what is going on. With the risk of high controversary you see so much cheating going on it's unbelievable. It all depends who you are and whether you get caught or not. I refuse to cheat whether it's illegal fuel or oversized engines or what ever. If you get caught every result you have ever had is in doubt. All I will say is that the ACU regs call for a £ 400 deposit for a fuel protest but for the T.T. it's £ 600, Why do you think that is? That is all I will say on that subject. Who do you rate as the finest Local Rider of recent Times? 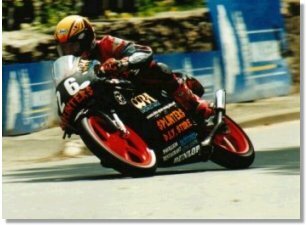 There have been some great Manx riders in the past. Kenny Harrison, Gary Radcliffe and Phil Hogg.Now I believe that Paul Corrin will be one of the best we have seen. He was so unlucky to be taken out at last years Manx, but he will be up there this year. He has the very rare quality of not looking very fast even under pressure. He is still a relative a newcomer but a couple more years and he will be the man. Do you think the T.T. has a long term future? Not in it's present form. I am afraid the organisers and the decision makers appear to be blinkered as to what is happening around them. We desperately need new people with a bit of foresight and move into the 20th century. They are relying too much on the history of the T.T. and not trying to look ahead. There are too many hangers on and people with vested interests making large amounts of money out of it. I heard that the T.T. generates 50 - 70 million pounds. Where does that all go? Last year I was 8th in the 125 race and made £ 450, but it cost me £2000 to do it. The T.T. is a top international event. I can't think of any equal event where the competitor pays the organisers to let them compete. Imagine charging Stephen Hendry £200 entry fee for the snooker thing. I don't think so. With the best will in the world the flexible friend will only flex so far. What about the Isle of Man Racing Scene? Who do you believe is the greatest rider today? I think although not a very likable bloke, Kenny Roberts JR has everything. He's very fast and very steady, I would love to see him at the T.T. Course 130 mph lap no problem. Which bike would you most like to ride around the T.T. and Why ? A 500 V Twin Honda G.P. bike. 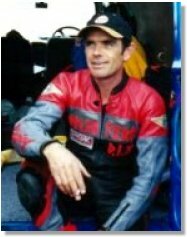 Jim Moodie passed me on his a couple of years ago, when I was on my old 250 Yam. I just could not believe how quick it was and how it appeared to be on rails. Awesome. If you could own any bike in the world which would it be ? The 250 Honda 6 without a doubt. I am available to ride one by the way if anyone has got any knocking about. What is the fastest machine you have ever ridden ? 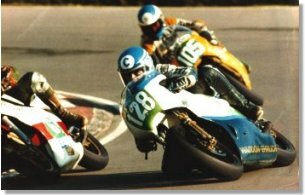 I had a TZ 500 Yamaha in 1982 this thing was awesome. It was clocked at 176 mph at Jurby Road in 1982. But wouldn't go around corners. After the 1982 T.T. 6 Laps and I couldn't walk or even stand up for about 4 hours. I felt really stupid sitting on the grass by the beer tent unable to move. The problem was you had to steer it with your knees and heave it into corners but this knackered your hips after a couple of laps. I remember thinking if that flag is not out this time I am pulling in anyway. My hands were covered in blisters but it was a wicked bike for it's day. When you retire what will you do? I would like to develop and manage a Race Team. To get a young rider of 11 or 12 years old and turn him in to a World Champion would be my ultimate ambition. The Europeans do it so why can't we? How long will you continue to race? I actually retire every winter. I don't know when I will mean it though. I still love it and as long as I am still competitive why quit. I want to stand on that T.T. rostrum just once before I retire. Well, Thanks for giving us a bit of your time and we wish you all the best for the future and hope to see you racing soon ! Thanks, and all the best to you and the team at TT Website.